June 6, 2018 Contact Author	Pia Long, Director, Olfiction Ltd.
IFF course students with their ISIPCA kits. Students can take a short trip over to Paris to visit Le Grand Musée du Parfum to explore perfume history. Founded in 1970 by Jean-Jacques Guerlain, ISIPCA's grounds consists of several buildings, one of which is partly dedicated to IFF's activities. Last autumn, I visited ISIPCA (Institut supérieur international du parfum, de la cosmétique et de l’aromatique alimentaire) in Versailles, and International Flavors and Fragrances’ (IFF) Neuilly offices, for a tour of the new Master of Science Scent Design and Creation program that the two have jointly created. I arrived just two weeks after the second intake of students had received their official ISIPCA kits. I spoke with tutors, students and IFF professionals about the new course and what it means to perfume education. I spent time with the course director, Barbara Gyde (IFF); Cécile Ecalle Montier, managing director, ISIPCA; and Philippe Dubost, director of education, ISIPCA, to attend some classes and two of the IFF Insight Sessions. It is worth noting that this is the first program of its kind offered in English and since it has been designed in collaboration with ISIPCA—the only institution in the world with an accredited Master's program in perfumery—the approach is unique. IFF continues to have in-house training programs and the students of this course are not recruited to IFF automatically – instead, they receive their MSc from ISIPCA and are offered internships at IFF during their second and third year, therefore giving the students a chance to explore their career options freely, but also giving IFF opportunities to identify and engage talent for any upcoming vacancies in a variety of olfactive and related roles across the world. This method of training future perfumers, evaluators and other fragrance professionals represents a paradigm-shift. The historic reasons for France’s dominance in the world of fragrance aren’t enough to explain why France continues to produce world-leading perfumers and other scent professionals. There are cultural factors which appear to prime children to becoming more aware of odors and flavors during their formative years, and an interest in fragrance is a kind of self-fulfilling prophecy – its presence in the public consciousness and everyday living begets more of the same. This is not to say that only France can produce excellent fragrance professionals (although this is often how the scenario is erroneously presented), but it does mean that being born French gives you an advantage because you have a better chance of accessing the industry from a country whose educational systems are already linked to it. ISIPCA collaborates directly with more than one university, with the science portion of the degree handled by the university, and the specialist, industry-specific areas covered at ISIPCA. Another exciting reason to keep an eye on the IFF program is, therefore, what it will do to levelling the playing field over the coming years – putting an international group of students together in the heartland of perfumery for a Master's course of this kind, and having all the teaching in English, could result in changes to the industry that we are yet to anticipate. Perfumers have been hidden and deliberately mythologized since the beginning of perfumery. In many ways, this is beneficial to marketers – we all know that consumers love stories and magic. This does present some problems with new career hopefuls – because often you have to unpick certain concepts before you can start and introduce students to the realities of the fragrance world. Ideas of perfumers as troubled geniuses, spending their days wandering through lavender fields in eccentric jackets or being born as undiscovered talents, ready to become famous, once discovered, can infiltrate the subconscious expectations of even the more educated fragrance enthusiast. On the other hand, modern marketing demands the ability for perfumers to at least be presentable and articulate story-tellers – because not only are there more reasons for brands to put the perfumer in the spotlight these days, but working in fast-moving corporate environments, while also being highly creative, means that you need a very unique mixture of characteristics in a person to thrive. Consumers are increasingly interested in how their products are made, and who makes them. Many brands still leave out or obfuscate the perfumer entirely. Large fast-moving consumer goods brands don’t want to break the consumer product-equivalent of the fourth wall and reveal too much of the myth behind the magic. For a young hopeful, wishing to enter the world of fragrance, this can be a confusing mix – and a little bit of a hidden stumbling point: how would anyone outside of the industry know that their perfect career could be an R&D perfumer or an evaluator, when most people aren’t really aware these jobs exist, much less what traits in a person would make them suitable for such a role? How can someone really know if they would make a great fine fragrance perfumer when their image of the profession and the day-to-day reality is likely quite distorted? IFF has been steadily evolving their approach to media relations, relaunching their brand and social media channels in 2015. They have been running speed smelling sessions for journalists, creating more direct contact with perfumers to help shape the public’s perception of the profession. Now, with the Master's of Scent Design and Creation, they are looking to innovate the training of the perfumers and evaluators of the future. Founded in 1970 by Jean-Jacques Guerlain, ISIPCA is situated on secluded grounds in Versailles, about 30 minutes from central Paris. The school itself occupies several buildings, one of which has now been partly dedicated to IFF’s activities. The building IFF students occupy used to be a private residence, and the rooms that are now their fragrance laboratories were converted from a ballroom. ISIPCA itself is somewhat obfuscated in the perception of the public who know about it – it is much more than a perfumery school, and actually describing it as such would do it a disservice. Both because the courses offered are much more varied, and because the aim of the institution is to prepare employees for the industries it serves and to provide on-the-job training as a trainee perfumer, cosmetic scientist or a flavorist. It aims to prepare students for the rigors of laboratory best practice, handling of raw materials, understanding of necessary chemistry concepts – and much more – in a way that companies actually need their future employees to be. ISIPCA’s approach is therefore not purely academic; it is a mixture of pragmatic and academic. Students are tested on analytical abilities and distinguishing scents during the screening process. Its prospectus includes a foundation degree where for the first two years of the course, students cover both fragrance and cosmetic science and only choose a specialty on their last year. “We prepare people for becoming evaluators, for becoming quality control managers and flavorists – not just perfumers. We have courses from the beginner level to the perfumer level and we cover all the different steps between the perfumer and the technician – teaching people how to prepare the ingredients, make dilutions and compound in the lab,” explains Philippe Dubost. Indeed, the school houses several laboratory environments, specific to the task at hand: the flavor laboratory has two parts – the area for mixing flavor ingredients, and the area for cooking (flavorists’ version of application testing). “We must taste what we create, just as we must smell what we create, too,” says Philippe, “and we also teach students how to develop consumer panel tests.” Indeed, the school has some of the same facilities for scent evaluation as you would see in leading fragrance companies, including evaluation booths and olfactive testing areas. There is a high level of industry collaboration and integration, with work placements, internships and other connections. The school is active in shaping the industry, not just passing on existing knowledge. The campus also includes R&D laboratories where tutors help cancer research and criminal investigations – an obvious place to come to for expertise in odor-related analysis. There are summer schools and continuing professional education, too – one of the fastest-growing areas in the industry has been regulatory, and ISIPCA offers training in this area as well. IFF’s program is a three-year Master's, with the first year focusing heavily on raw materials, just like an internal perfumer training school would. There is a prerequisite of having first earned a science degree of some kind (preferably in chemistry), although the first year’s intake included two students with no previous science background. “We do look at the overall application and the suitability of the whole profile. If the candidates haven’t got a chemistry background, we ask them to complete an introductory chemistry course prior to starting here, just to make sure they will be able to handle the basic concepts,” explains Barbara. The tuition fee is e10,000 per annum which is actually very reasonable, considering the kinds of fees you have to pay for a Master's in science in other institutions, especially ones in the USA. The fee may seem steeper for students coming from countries where higher education is free. Once the initial selection has been made, successful candidates are invited to a screening interview via Skype. The ones who pass that stage are put through an olfactive intelligence test: “The candidates that we select from screening are invited to an IFF creative center where they take the olfactive intelligence test which is a trademarked test developed by IFF. We think it’s the most intense in the industry and it’s four and a half hours long. It measures two areas: their ability to distinguish and remember scents, and their analytical abilities. So there are two scores. And they need to have a certain grade – a certain level of native olfactive ability – to pass,” Barbara explains. In IFF’s inaugural year at ISIPCA, 13 students were selected and 20 students for the second. “Students may end up taking different paths than they originally intended. They mostly come in thinking they want to be fine fragrance perfumers but we believe that of the people that graduate, some may follow the path to become consumer fragrance or technical perfumers, some may become R&D, some may obviously go into other areas,” Barbara says. In their first year, the students get a mix of very traditional foundation training – studying raw materials, history of perfumery and existing fragrances – blended with a more modern and IFF-specific approach of high level of access to in-company expertise via the IFF insight sessions. These sessions allow students to learn from and interact with experienced perfumers and scent design managers (IFF’s term for an evaluator). The insight sessions are a particularly useful way of genuinely preparing students for the real world – giving direct access to experienced, working professionals in a mixture of talks and Q&A sessions. The opportunity for the students to hear what it is actually like to work as a scent design manager or a perfumer from someone currently working in these roles, and to ask any kind of question they may have, is an invaluable resource. The arrangement captures best of both worlds: the famed French know-how, combined with IFF’s expertise. “I think this course will be a continuing work in progress. We are learning together, and learning from the students, too, because the mix is so interesting,” Barbara says. Ultimately, since it takes so long for a perfumer to mature from a trainee to a professional, and since businesses need to plan ahead, it makes sense to try different approaches to succession planning and strategic business planning. This way students pay for their own training and upkeep, while IFF supports their progress without committing to any individual until their skills are developed and assessed. 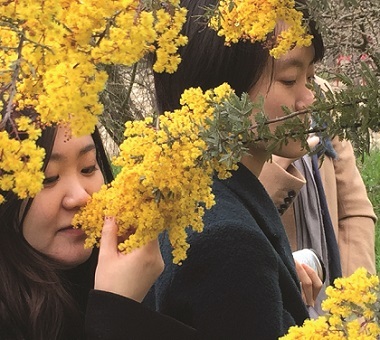 Fragrance businesses are continuing to search for talent from developed and emerging regions, but a global approach hasn’t always been sufficient to reach everyone they could have. There are upcoming vacancies in IFF, which will most likely be fulfilled, at least in part, by students from this new course. The entry requirements and application process are still strict, but it is apparent that IFF have gone out of their way to cast a wider net and are not just talking about making perfumery more global, but actually making it happen.